Step 1 Rinse the lentils thoroughly and soak them in 1 1/3 cups of water, covered, for about 1 hour. (They will probably absorb all the water.) Transfer the lentils and any remaining water to a heavy-bottomed pot. Add 1 1/2 cups of water and bring to a boil over medium heat. Reduce the heat and simmer until the lentils are soft but not mashed, 20 to 25 minutes. Turn off the heat and cover the pot. Step 2 While the lentils cook, heat the oil in another heavy-bottomed pan over medium heat. Add the garlic and cook for 1 minute. Add the onion and cook until it turns light brown, about 10 minutes. Add the tomato and cook until soft, 5 minutes. Drain the lentils and add them along with the spinach and chile. Add the salt. Stir and cook for 2 minutes on medium-high heat. Serve hot, garnished with the ginger. In Recipes-list.com we have selected the most viewed recipes from category - Sides Vegetarian . Enjoy the best recipes specially selected for you! 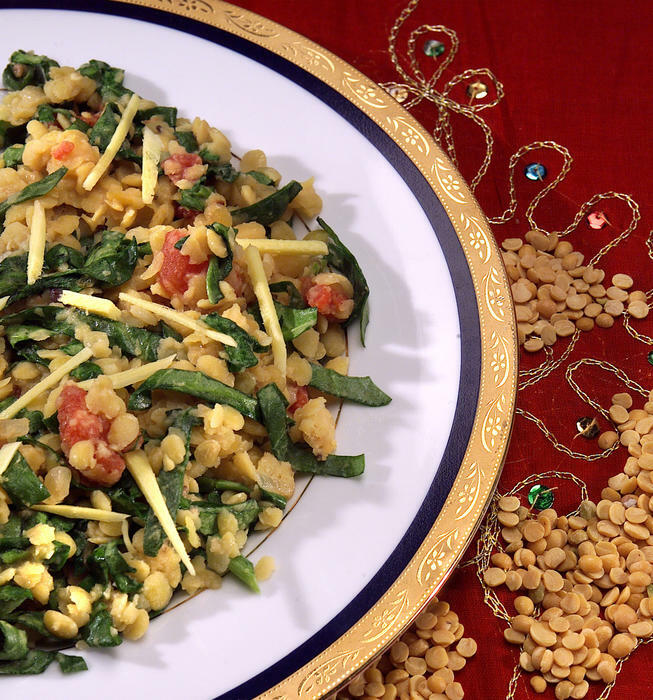 Lentils With Spinach is the right choice that will satisfy all your claims.